There is a backstory to the Dred Scott decision. New information reveals that Harriet Scott, who was involved in the original suit for freedom with her husband, lived for a decade after the Civil War. The Scotts had two children. Eliza and Lizzie were given the protection of anonymity during the fractious period in which the Scotts sought emancipation. 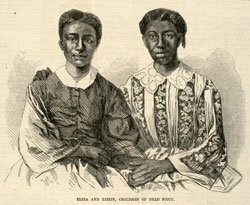 Genealogist Ruth Ann Hager of the St. Louis County Library did the research, which is outlined in her book Dred and Harriet Scott: Their Family Story.